YouTuber Keemstar of the channel Drama-Alert, with approximately 4.5 million subscribers and covers topics of controversy on the platform, found himself in one of his own involving the furry fandom this week. On his twitter account he made a quote of saying that furries “must be deleted” and that he wished to make a video game in which you hunt and kill furries. Two furry Youtubers, 2 the Ranting Gryphon and Tantroo McNally, find themselves in a poignant brouhaha. It all started in mid-February when an infamous furry comedian made a statement on hate crime statistics, and would lead to a long winded discussion of righteous condemnation that left audiences in awe at how two angry old men could find literally nothing better to do with their time. The Southern Poverty Law Center tallied 1064 incidents of hate crime in 2017, relatively few ending in death. The La Jolla Playhouse, in La Jolla, California, a suburb of San Diego, will present the world premiere of a new play, “The Squirrels”, during its 2018-2019 season. The dates and casting have not been set yet. “The Squirrels” by Robert Askins, directed by Christopher Ashley. Winter is on its way, and the squirrels are restless. Mistrust is growing between the Grey Squirrels, who enjoy a rich cache of nuts, and the outcast, hungry Fox Squirrels. When a wily outsider ignites a savage war, the consequences are catastrophic. This epic play reveals the animal instincts driving us all. The choice of species is fitting for the local given the squirrels in Southern California are primarily fox squirrels and gray squirrels. An article on November 8 in the San Diego Union-Tribune says that Director Ashely calls the new work "playful and super-funny and unexpected in every possible way," and says that as with good sci-fi, the fantastical setup allows the piece "to explore our society with just enough remove that you can make bold, interesting statements. It’s squirrels in a tree, but you would recognize lots of things in this cultural moment." Ashley noted that the costumes were not going to look like 'Disneyland', but they will convey an essential ‘squirrel-ness,’ to coin a term. Tickets to the Playhouse’s 2018-2019 season are available only via subscription at the moment: (858) 550-1010 or lajollaplayhouse.org. Keep tuned in as more news will be added here when it is available. It will be interesting to see how much the play’s costuming looks like fursuits. Washington state has had a rough time with furry conventions in recent history. Rainfurrest had to shut down after they gained a sour reputation with hosting hotels due to reports of vandalism. So local furries were elated to hear of a new organization starting up by the name of Anthro Northwest. This convention, while a bit more stringent on their rules (particularly around adult material), was a welcome possible restart in relations with hotels in the region with furries. But as activities started word leaked onto the internet of on camera release forms being deseminated for a show called "This is Life with Lisa Ling", a property of the channel CNN. Instantly locals had recollections of another incident that had occurred at another pilot convention one state south, Furlandia. Update 11/15/17: Attendance has been announced and Anthro Northwest has been noted as being the largest attendance for a first year furry convention at 809, article updated to reflect this. August has seen a lot of drama, but what drama was the most dramatic? Are we scaring away potential furry fans? Google says yes. I detest unnecessary wordiness, but keeping it short just doesn't work. Before I begin, I would like to present an apology of sorts to Patch Packrat. I very much dislike to be misunderstood, but also cannot stand to be the source of said misunderstanding. I guess I should have been more clear with my choice of words. Now, with that out of the way, today's topic. I like drawing talking animals, but I don't have a fursona/fursuit, so I'm not a furry. I like drawing talking animals, but to me it's not a "lifestyle", so I'm not a furry. 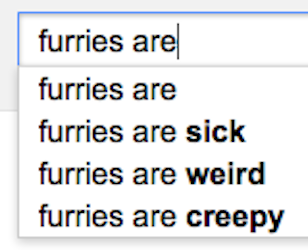 Furries are creepy, and I don't want to be associated with them. Answer #3 was the most prevalent. Drama: it's a complicated little word that with a large negative connotation when used within the furry fandom. There are those who don't always see the best in furry; who point out flaws in what sometimes seem an overbearing manner, and decry some within the fandom from their own corner of the web. These voices may seem pointless at best and harmful at worst to the health and enjoyment of the furry fandom. However, a recent event in the college football fandom might show why furries who see and speak no wrong in the fandom could be just as harmful as those who see only wrong in it. To celebrate the recent premiere of Red Lantern: Conviction, Isiah sat down with Rukis to discuss her latest publication, Unconditional. Isiah Jacobs: Hello again, Rukis! It's so nice to have you on the show again! It's been too long! Rukis: That it has. Wait . . . it's been like a few months. Really not that long, honestly. Isiah Jacobs: Much too long, in my opinion! I'm sorry you couldn't make it for the interview with Kyell Gold about Green Fairy. However, by that time, you were busy wrapping up Unconditional and preparing for AC, so I don't blame you. You had originally started working on this back in January or so, right? Rukis: That was the plan. Progress was slow for a while, though, for purely financial reasons. It's tough to work on a free-to-read comic and pay the bills. The income I see from comics generally comes after they've been printed. So it's always a balancing act, making time for them. Isiah Jacobs: Were you a little upset to work on your own again after working with Alector for so long? Rukis: Not at all. I enjoy working at my own pace, honestly. I've only got myself to answer to. And I also really want to improve my background work before I work on Conviction, and this was a good opportunity. All but Wolfe were brought from Furocity and placed directly into administration positions. Grammatist cited privacy concerns as the reason for his resignation; three others directed criticism towards the original FA staff members, and slammed Dragoneer for poor leadership.